26-series top hardtail as MTB. Our 26" aluminium hardtail, with a permissible total weight of 120 kg, convinces on exciting off-road tracks as well as in everyday use. 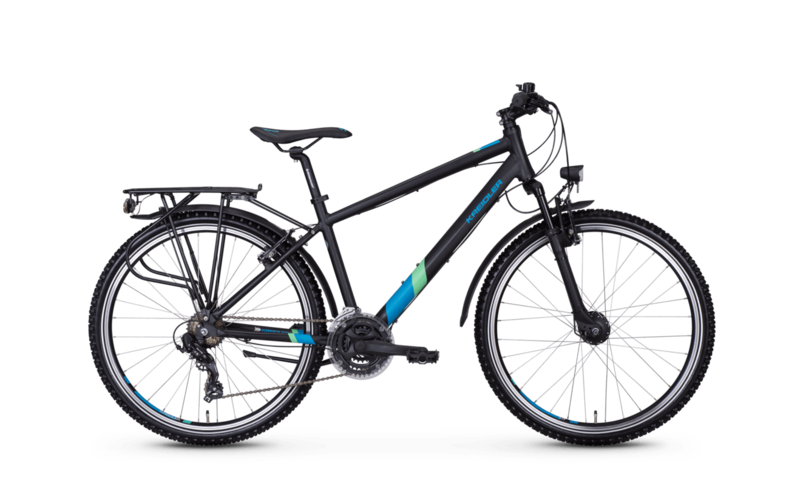 Thanks to its roadworthy equipment with parking light, luggage rack and robust mudguards, the mountain bike not only stands for lots of off-roading fun, but is also the ideal companion for commuters or the school run. The matte black aluminium frame offers perfect control and agility even on uneven surfaces. With a weight of just over 16 kg and a proven Shimano cassette, the mountain bike will bring you safely and reliably to your destination. The Dice is the optimal solution for everyone who wants to use their bike in a variety of ways. In the morning to get to school safely and in the afternoon to push yourself off the beaten track.